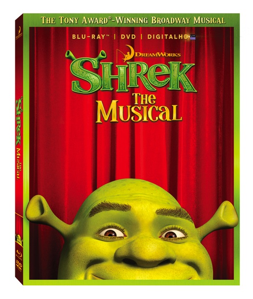 Shrek: The Musical Now on DVD! With the Blu-ray, DVD and Digital HD release of Shrek The Musical, fairy-tale fans and musical theatergoers alike can now experience the Grammy-nominated stage production in the comfort of one’s own home! 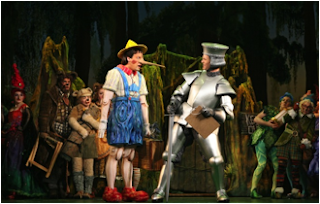 Featuring a fantastic score of 17 brand new songs, Shrek The Musical was filmed on stage to capture the magic of a Broadway performance and features an all-star cast. No digital interpretation of the stage would be complete without a state-of-the-art projector that can produce an image of up to 150 inches. If a projector is too costly, a 40 inch television or larger will suffice to give the home audience the optimum visual experience. No ultimate living room entertainment set-up would be complete without a crisp surround sound system. With the ear being stimulated from 4 angles, the illusion of being immersed in a theatre can be achieved. Why not design your own tickets to your show? Guests will have to show their tickets before entering the living room for example. German Shepherds dressed in tuxedos make excellent ushers, too. 4. Wow, it’s Green in Here! With a simple purchase of green crepe paper attached to a range of living room light sources, a green filtered glow will engulf the room to create a wonderfully Shrek-like ambiance. The anticipation of waiting for the famous theatrical curtains to trickle away is no doubt one of the fundamental experiences of going to the theatre. With a curtain rail, fabric and some sticky tape, your living room will mirror the Gershwin’s famous curtain call in no time. Why not engage in a 15-minute interval? Prepare a refreshing beverage for the adults and load up on the ice cream for the kids. Don’t forget those little wooden spoons for the upmost authenticity. Don’t forget to clap along with the audience when something particularly amusing or impressive arises on screen. Booing and hissing at the respective villains may also prove effective. Please note, please do not throw your shows or any object at the screen for fear of damaging your precious TV set. 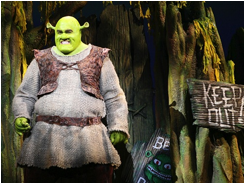 Will you be watching Shrek: The Musical with your kids? You can find it at most retailers and at Amazon.com in both DVD and Blu-ray formats for under $20!